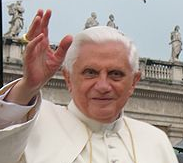 Those fiending for a glimpse of Pope Benedict XVI when he tours the country in mid-September, rejoice: the itinerary for his UK trip has been released. After spending a couple of days north of the border, he'll wing his way toward Wimbledon for a private Mass at the Chapel of the Apostolic Nunciature on Friday 17th September. Later that day he'll "address civil society" in the Palace of Westminster, and come evening, he will lead prayers in Westminster Cathedral. Saturday brings no rest: the hard-working Holy Father will hold a prayer vigil in Hyde Park on the Eve of the Beatification of Cardinal John Henry Newman, and will be driven in his Popemobile on a route around The Mall, Constitution Hill, and Hyde Park Corner. Police advise that this tour is the best place to get a glimpse. Later that day he'll depart for Birmingham. Further info is on the Foreign & Commonwealth Office website, while the Cabinet Office has travel advice and further details on the Popemobile route.